Simon & Schuster/Paula Wiseman Books, 9781481498326, 176pp. 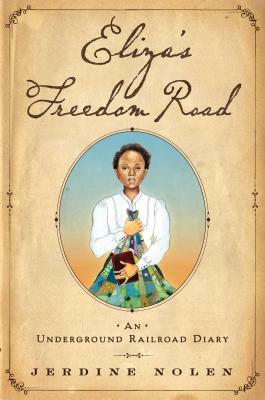 Christopher Award–winning author Jerdine Nolen imagines a young woman’s journey from slavery to freedom in this intimate and powerful novel that was named an ALA/YALSA Best Fiction for Young Adults nominee. It is 1854 in Alexandria, Virginia. Eliza’s mother has been sold away and Eliza is left as a slave on a Virginia farm. It is Abbey, the cook, who looks after Eliza, when she isn’t taking care of the Mistress. Eliza has only the quilt her mother left her and the stories her mother told to keep her mother’s memory close. All the while, Eliza recites the stories her mother taught her as she travels along her freedom road from Mary’s Land to Pennsylvania to Freedom’s Gate in St. Catharines, Canada, where she finds not only her freedom but also more than she could have hoped for. Shadra Strickland studied, design, writing, and illustration at Syracuse University and later went on to complete her MFA at the School of Visual Arts in New York City. She won the Ezra Jack Keats Award and the Coretta Scott King/John Steptoe Award for New Talent in 2009 for her work in her first picture book, Bird, written by Zetta Elliott. Strickland co-illustrated Our Children Can Soar, winner of a 2010 NAACP Image Award. She teaches illustration at Maryland Institute College of Art in Baltimore, Maryland. Visit her online at ShadraStrickland.com.